Genterprise has published a lot of DSiWare in the past year, mostly as part of a budget line called G. G. Series. These are small arcade-style games with a 200 Point price tag which have caught the attention of many who read our weekly Japanese download news because we just aren't seeing this kind of thing elsewhere for some reason. 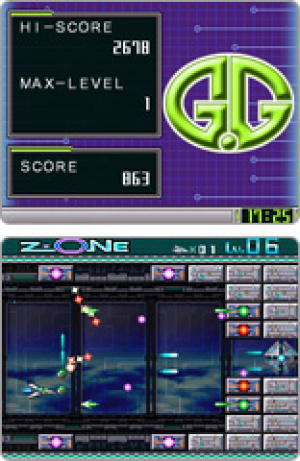 Z・ONE is one of the first of these games and along with many others in the G. G. Series it's developed by a company called Suzak, which has also developed F-Zero, Hamtaro and Domo-kun games on the GBA along with other titles on the DS and PSP. This is a simple shooter with a ship that looks much like the Vic Viper from Gradius, but the level design reminds us more of Konami's earlier shooter, Scramble. 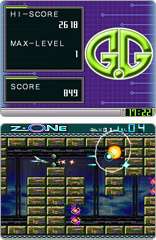 Enemies are static floating guns of a couple of different types which players encounter as they fly from left to right through various maze-like areas. Every other level features higher speeds and tighter corridors to navigate (though thankfully not as difficult as the harder levels in Scramble). There's occasionally an end-level challenge which consists of regenerating waves of the standard guns to survive and the addition of a large gun in upper levels. The player's arsenal consists of a couple of option-like pods at the front of the ship which will destroy enemies on contact and block enemy fire as well as fire guns of their own. You can fire in any of eight directions by moving your ship in the opposite direction that you want to shoot in and pressing one of the action buttons; holding it down will continue fire in that direction until you release it. 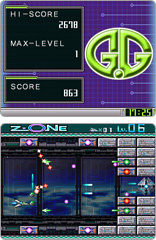 The action takes place in the lower screen, whilst the upper screen has the high score, highest level reached (we managed level 11) and current game score. There are no options to set, extra lives to earn or continues to exercise once your stock of lives run out. From this description it probably doesn't sound like much and it really is just a game to waste time with whilst waiting for a plane to board or a dental exam, but the detailed visuals make this more than a throwaway game. Ample use of parallax scrolling gives depth to alien base corridors featuring glowing lights and fine textures and the ship's options float about smoothly. Add in a few electronic audio tracks to distinguish speed runs from "boss" battles and it all comes together to resemble a game you might have seen in the arcades in the late 1980s-1990s - and that's certainly nice to see. I wish we got some of this kind of stuff over here. I'd be all over this. True, but then there's no Mighty Flip Champs, Flight Control or Pinball Pulse in the Japanese Shop, so it kind of balances out (from my point of view, anyway). @Sean+Aaron I guess that's true. I think the Japanese would like MFC, but I couldn't say about Flight Control or Pinball Pulse. Still, I'd get this in a heartbeat if it came out in the NA store. Provided it was 200 points, looking at the amount of content it has. I love SHMUPs and retro-styled ones make me dance with joy... We need some good ones on DSiWare. To be honest, I've been itching for almost all of the GG games to come here and this is one of the many that I'd love to get. True, but not for Pinball Pulse. Not for us in the old continent at least. I've been eagerly waiting for some announcement that it will see a release here but, like Excitebots, I hold very little hope for that at this point. Sounds interesting. I hope Genterprise realizes that North America eats up games like this, and will localize them over here as fast as they can make them for Japan. I think the problem is that despite being downloads getting access to the other territories isn't as easy as it could be; I suspect the main problem would be submission to game ratings boards (especially Europe, given it has three of them). You'd think someone like Aksys would approach them and do a package deal though, wouldn't you? Maybe the margins on 200 point games are too low to make it worthwhile for anyone but Nintendo? And agreed on Pinball Pulse and Europe - heck we're still waiting for Williams Pinball Classics and we're nearly two years on from the NA release (apparently the discs are pressed, but there's some final licensing rubbish to deal with)! We need more SHMUPs like these! And at 200 points?!?!? Definitely worth buying compared to Mario Clock and Mario Calculator! We need better budget games for the DSiWare!